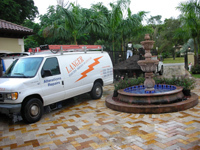 Established in 1939, Langer Electric Service Company has been serving Central and South Florida 's institutions, businesses and homes with quality electrical and energy management services for nearly 70 years. In addition to building a reputation as a reliable, quality contractor, Langer has also developed strong ties to local communities through active involvement in business, social and charitable organizations. With Langer Electric Service Company , you will always receive timely, efficient, quality service. We operate 24 hours a day – 7 days a week. We respond within hours - not days! We evaluate all employees on their abilities and their character. Your personal safety and belongings are our #1 concern. You can be assured that when a Langer Electric Service Company technician comes to your home, you will receive courteous and respectful service. We use only the best, top of the line products to assure you long service life and safety.